Product #20927 | SKU 9415-001-245 | 0.0 (no ratings yet) Thanks for your rating! 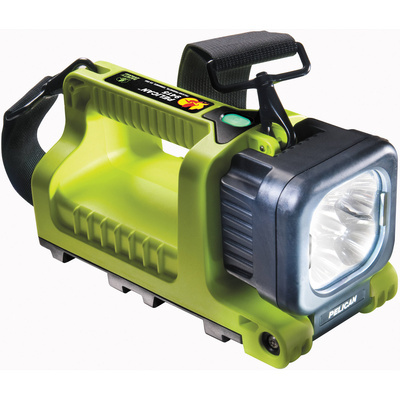 The 9415 LED Lantern from Pelican is a multi-output LED lantern with a maximum output of 413 lumens. This versatile light's head can rotate 120° and can stand on its base or on its end so the light can be precisely directed where it's need. The pushbutton switch cycles the 4-LED emitter array through the Low 159-lumen, High 413-lumen and Flashing modes. A battery status LED indicator is integrated into the switch. The ABS thermopastic body is impact and temperature resistant. Since the platic body resists temperature extremes, it is more comfortable to handle in cold temperatures than aluminium. The lantern comes with a removable shoulder strap, a rechargeable battery pack and AC charging adapter.